When Potomac Conservancy saved White Horse Mountain from development last year, we knew we were protecting an important tributary to the Potomac, the South Branch, and protecting a crucial 1,700-acre forest — one of the largest remaining tracts of undeveloped land in the region, in fact. Conserving healthy land is one of the most powerful tools we have in the fight for clean water. A year later, we’re still discovering more about White Horse and the animals that call the mountain home. We recently learned there are some pretty cool critters hiding out on the mountain: bobcats! The West Virginia Department of Natural Resources (WV DNR) has been conducting a population study of bobcats in the state and recently spotted one with a motion activated camera on White Horse. Check out the bobcat! It was caught on camera in the early morning hours. Today, bobcat populations are stable throughout most of North America, but various agencies continue to monitor them in order to ensure it stays that way. You can more about this study's preliminary findings in WV DNR's newsletter. 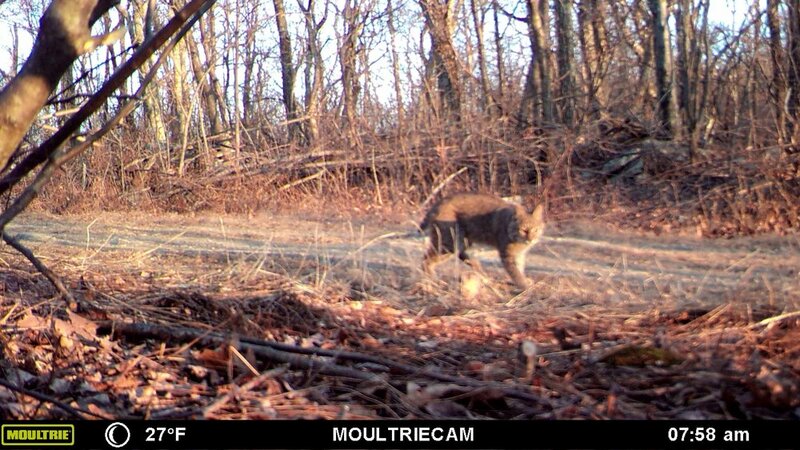 Although rarely spotted by humans, bobcats roam much of the continent, including rural areas west of Washington, DC. Around two times the size of the average household cat, bobcats’ fur is brown with varying dark spots and lined markings. Covert and nocturnal creatures, bobcats live largely solitary lives. There is a misconception that bobcats are aggressive and are a danger to dogs and small children. This is untrue. Though bobcats can, on rare occasions, hunt prey larger than themselves, their diet consists mostly of rabbits, mice, squirrels, and other small animals. In fact, the wild animals often thought of as most dangerous to humans — bobcats, mountain lions, bears — are less dangerous than deer, which cause 1 million traffic accidents per year in the US, leading to 200 deaths, and over $1.5 billion in damage. Bobcats are an important part of our ecosystem, and we’re excited they’ve found a home on White Horse. If you want to help protect these majestic cats now is your chance! We’re in urgent need of support to finish the second phase of the White Horse Mountain project. We're raising funds to turn the mountain over to the state of West Virginia, creating the area’s newest public conservation area. Once we raise the funds to repay the purchase loan for the property, the mountain will become public land, open to everyone to enjoy. You can have a hand in saving healthy habitat for bobcats, bears, birds, and countless other animals. And you’ll be protecting the Potomac River and the drinking water of millions!